Winter aconites are the first plants to flower in the garden. 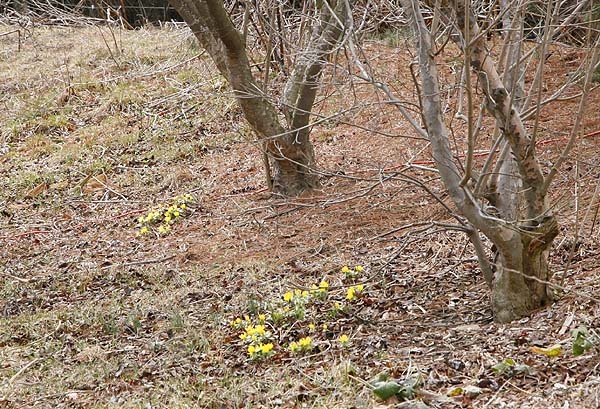 The snow melted yesterday and there under the snow were the bright yellow buds of the winter aconites (Eranthus hyemalis) Two days later the sun came out and the flowers opened and turned their little yellow faces to the adoring sun and laughed at winter. Winter aconites are really tough little guys and even though everyone says that snowdrops are the first sign of spring mine have yet to even show a leaf. 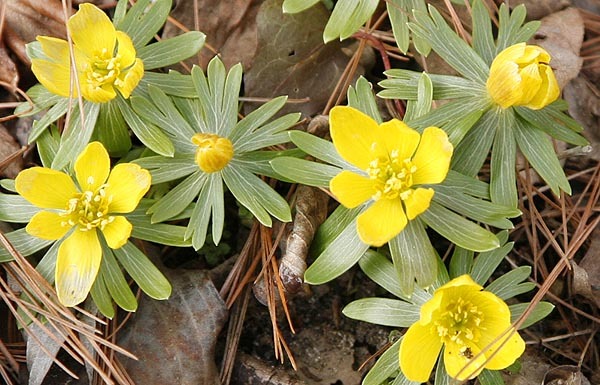 If you want early spring color in the garden to cheer your spirits then winter aconites are the way to go. These lovely little yellow flowers grow low to the ground they produce a starburst of flat green leaves with one yellow flower in the center. Aconites grow from tiny bulbs about the size of a pencil eraser but they will self seed nicely once they are established. Collecting seeds is tough though, we tried it, it’s extremely time consuming and not at all cost effective. This is why the plants are usually sold as bulbs, which at present we don’t sell. 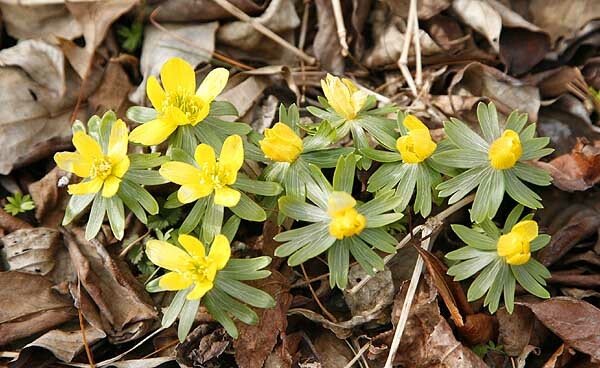 Aconites thrive in areas where there is summer shade. So planting them under deciduous trees where they get lots of winter sunshine but are shaded during the summer is ideal. The lovely rosette leaves last into the early summer providing a nice ground cover in the first part of the year. After that the bulbs go dormant during the summer months. Don’t plant under bird feeders since they come up at the time feeders are most active they just get pecked to death. Birds don’t care about plants they care about the seeds around them. 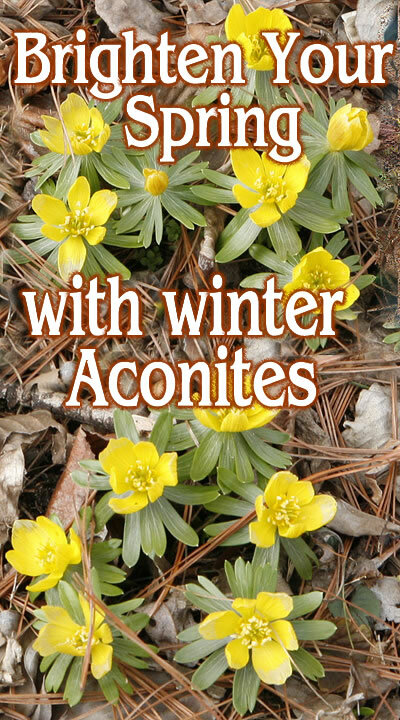 Aconites are a cold loving species they are hardy from zones 3 -7 so they won’t grow in the warmer areas, but heck you don’t need spring indicators in the south! They will tolerate some moisture all year around but do like well drained soil. They thrive in sunshine or semi shade but not under pine or fir species. They like a rich humus soil which is found under deciduous trees. Left alone they will self seed and form a carpet of yellow flowers in early spring, then a ground cover which can be mown back by early to mid summer so they are ideal in a grassy area under trees or mixed with later growing perennials. Winter aconite flowers open and close with the sun. when the sun is shining their petals open and they bath in the bright rays, when it goes down or on cloudy days the petals stay closed. The flowers can last for several weeks. More if there are a lot of cloudy days and less if there is lots of sunshine and warm temperatures. I started my winter aconites with a dozen bulbs about 25 years ago, planted them outside my living room window they grew and proliferated. It was wonderful looking out the window every spring at the constantly increase carpet of early yellow flowers. When I moved this farm twelve years ago I dug up as many as I could which turned out to be a several hundred. Not all of them survived the journey but a lot did. I planted these under trees and in flower beds that I can see from my dining room and living room windows. I think its important that you can see them from the house windows, it’s the first sign of spring in cold weather when most people are not working outside. Being able to appreciate them from the house lifts the spirits and see proof that spring is just around the corner. Back at my old house there is still a carpet of aconites every spring so I obviously only got a few of them. Now I have a large clump on the berm under some of my Kousa Dogwood trees. These are always the first to flower as they get the most winter sunshine. The ones outside my living room window are located in a sheltered northern exposure and come up about the same time but don’t open as quickly. The ones in less sheltered northern exposures still have not shown themselves yet. This is fine by me. It means that my enjoyment of the yellow flowers is extended. The ones of the berm get mown over during the summer as they are in shade loving grass. The ones in the flower beds are mixed with Hostas which come up later in the year, about the time that the aconites are going down. So I get a carpet of yellow flowers followed by bright green ground cover with new Hosta leaves growing through them. By time the Hosta leaves are growing large the aconites are going dormant. It’s perfect. Very early flowers are also important to pollinators especially honey bees. On warm late winter days they can come out of the hive for a fly around and a bathroom break. (bees don’t ‘go’ in the hive so these gals have been holding it all winter!) Finding some flowers while they are out is always a great bonus for them and an extra energy boost. I love my aconites and always suggest that any gardener plant some. Brighten those winter blues with yellow flowers! Previous Previous post: WHAT IS A PLANT ZONE? Next Next post: 12 Reasons to buy seed to start your plants this year.